These ornaments have been hugely popular! I made a bunch to sell at a craft show earlier this year, and I sold quite a few. I did hear a couple of people refer to them as ice cream ornaments, and that's okay. Ice cream or cupcakes - they're still stinking cute! The supplies you'll need for this project are few, unless you have zero crafting supplies. The time involved in making these is a bit longer than the ornaments I usually make and while the skill level is still beginner, I would say it is less beginner than other ornaments I've made, too. That being said, you have plenty of time to make quite a few of these to give at Christmas! Make them in your kids' favorite colors or their birth month colors. Print this cupcake template twice or any other template you like. Cut out the wrapper template; be sure to cut the wrapper a little taller than is shown on the template. From the other copy of the template, cut the frosting template. Pin the frosting template to white felt and cut out two pieces. This will make one ornament. Pin the wrapper template to the color of your choice and cut out two pieces. Pin one frosting felt piece to one wrapper felt piece and sew along the bottom of the frosting with white thread. Pin the second frosting felt piece to the second wrapper felt piece and repeat sewing. Using thread to match the wrapper, make a loop on the back felt piece. This will allow your ornament to hang from a tree branch. 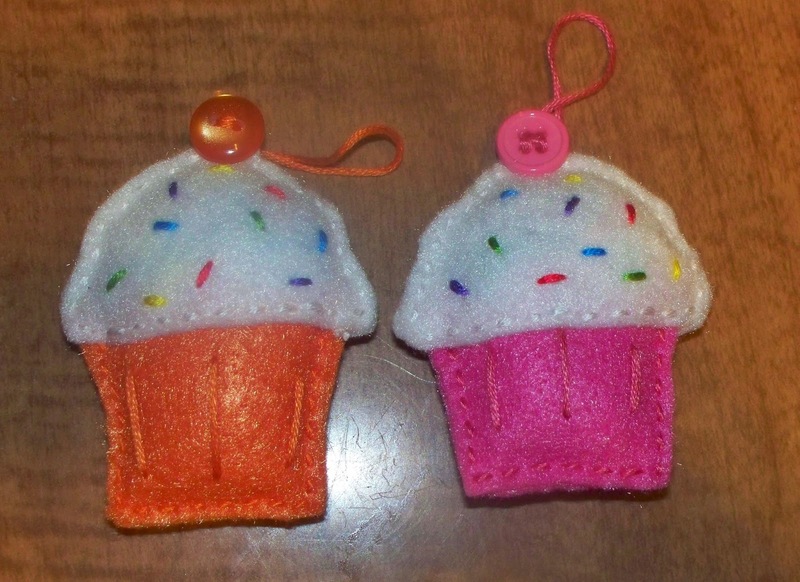 Using a variety of different threads, sew sprinkles onto the front felt piece. You could just use one color, but I like a lot of different colored sprinkles for my ornaments. I just did a straight stitch for my sprinkles; you could choose to do French knots. If desired, using thread that matches the wrapper, sew lines onto the front piece on the wrapper part, as shown in the picture above. This isn't a necessary step, but I think it adds a nice touch of detail. Once all the little details are done (minus the button), pin the two pieces together. Using thread to match the wrapper, sew the two pieces together along the wrapper. Then, using white thread, sew the two pieces together along the frosting, making sure to leave a big 'ol open spot at the top. Stuff your cupcake with fiberfill so it's nice and plump. Sew the opening closed with white thread. With thread to match the button, sew the button at the top of the ornament.